Pratte, B. S. and Thiel, T. (2017). Fluorescence in situ Localization of Gene Expression Using a lacZ Reporter in the Heterocyst-forming Cyanobacterium Anabaena variabilis. Bio-protocol 7(1): e2084. DOI: 10.21769/BioProtoc.2084. One of the most successful fluorescent proteins, used as a reporter of gene expression in many bacterial, plant and animals, is green fluorescent protein and its modified forms, which also function well in cyanobacteria. However, these fluorescent proteins do not allow rapid and economical quantitation of the reporter gene product, as does the popular reporter gene lacZ, encoding the enzyme β-galactosidase. We provide here a protocol for the in situ localization of β-galactosidase activity in cyanobacterial cells. This allows the same strain to be used for both a simple, quantitative, colorimetric assay with the substrate ortho-nitrophenyl-β-galactoside (ONPG) and for sensitive, fluorescence-based, cell-type localization of gene expression using 5-dodecanolyaminofluorescein di-β-D-galactopyranoside (C12-FDG). Anabaena variabilis is a filamentous cyanobacterium that differentiates specialized cells called heterocysts that function specifically for nitrogen fixation (Kumar et al., 2010; Maldener and Muro-Pastor, 2010). We use the lacZ gene of Escherichia coli as a transcriptional reporter of cyanobacterial gene expression because of the ease of a quantitative, enzymatic, colorimetric, β-galactosidase assay in 96-well plates (Griffith and Wolf, 2002) and the ability to use the same strain for in situ localization of gene expression using the fluorescent substrate 5-dodecanolyaminofluorescein di-β-D-galactopyranoside (C12-FDG) (Thiel et al., 1995; Ma et al., 2016). One of the earliest reports of lacZ as a reporter was the fusion of malF, encoding the maltose transporter, to lacZ, which resulted in localization of β-galactosidase activity to the cytoplasmic membrane in E. coli (Silhavy et al., 1976). Since then lacZ has been used as a reporter in bacterial, plant and animal systems; e.g., the stable transfection of mouse tumor cells with lacZ allowed single cell histochemical staining using the chromogenic substrate 5-bromo-4-chloro-3-indolyl-β-D-galactopyranoside (X-Gal) (Arlt et al., 2012). In fact, most cellular localization of expression of lacZ has used X-gal, which is relatively inexpensive, easy to use and provides an easy visual screen. Our initial attempts to use X-gal and other chromogenic substrates in Anabaena were unsuccessful because the colored products were toxic to cyanobacteria and often resulted in cell lysis. In addition, the cyanobacterial pigments, including chlorophyll, phycocyanin, and carotenoids, made color detection difficult. We also attempted to use the fluorescent substrate, 4-methylumbelliferone β-D-galactopyranoside, whose product, 4-methylumbelliferone, emits in the blue range; however, we were not able to detect fluorescence over the background fluorescence of the cells. Finally we tried fluorescein β-D-galactopyranoside (FDG), a very sensitive fluorogenic substrate for β-galactosidase. FDG, which is not fluorescent, is hydrolyzed in two steps by β-galactosidase, first to fluorescein monogalactoside and then to fluorescein. We modified the method developed to visualize lacZ expression during sporulation in Bacillus subtilis (Bylund et al., 1994; Chung et al., 1995). That protocol specified 5-octanolyaminofluorescein di-β-D-galactopyranoside (C8-FDG); however we had poor results with C8-FDG, so we tried the more lipophilic 5-dodecanolyaminofluorescein di-β-D-galactopyranoside (C12-FDG) (Miao et al., 1993; Plovins et al., 1994; Zhang et al., 1991), which has 12 carbons added to the fluorescein in FDG. C12-FDG proved to function well in cyanobacteria. Using C12-FDG we have been able to easily visualize heterocyst-specific expression of genes, such as cnfR1, the activator of the nitrogenase genes in heterocysts (Pratte and Thiel, 2016), fused to lacZ (Figure 1). *Note: These products have been discontinued. Starting from colonies on agar plates, inoculate strains of A. variabilis or Anabaena sp. PCC 7120 containing lacZ fusions (constructed as described in Pratte and Thiel, 2016) in AA/8 containing 5 mM NH4Cl and 10 mM TES, pH 7.2 and antibiotics, when necessary. Shake cultures at 170 rpm at 30 °C in 100-120 μE/m2 s light and allow to grow for about 10 generations (3-4 days). Two days prior to nitrogen-stepdown, dilute cultures 1:100 in AA/8 containing 5 mM NH4Cl and 10 mM TES, pH 7.2 and allow them to continue growing at 30 °C with shaking and light to an OD720 of 0.1-0.2. Cyanobacteria should be actively growing for several generations so that they differentiate heterocysts well after the removal of fixed nitrogen. Consistency in growth conditions improves the reproducibility of β-galactosidase production in the cultures. Wash actively growing (step A2) cyanobacterial cultures 3 x in AA/8 to remove nitrogen. Resuspend cultures to an OD720 of < 0.1 in 125-ml flask containing 50 ml AA/8 with (+N) or without (-N) 5 mM NH4Cl and 10 mM TES, pH 7.2 and grow for 24 h with light and shaking. Check cultures for heterocysts prior to starting in situ localization assays. Spin down 2-5 ml culture in 1.7 ml Eppendorf tube for 5 min at 16,000 x g in microfuge. Wash cells twice with 500 µl water to remove growth medium. Fix cells in 500 µl 0.04% glutaraldehyde at 25 °C for 15 min. Centrifuge cells for 1 min at 16,000 x g in microfuge and remove glutaraldehyde solution. Wash pellet twice with 500 µl water to remove residual glutaraldehyde. Resuspend pellet in 30 µl of substrate - 100 µM 5-dodecanoylaminefluorescein di-β-d galactopyranosine (C12-FDG) in 25% DMSO and incubate in the dark at 37 °C for 30 min. Centrifuge cells for 1 min at 16,000 x g in microfuge and remove substrate. Wash pellet twice with 500 µl water to remove residual substrate. Note: This step is important to achieve low background fluorescence. Resuspend pellet in 20 µl of antifade solution to keep the fluorescence stable. Keep cells in the dark until visualizing on microscope. Proceed immediately to imaging. Add ~2 µl of prepared cells to microscope slide with cover slip and visualize on a Zeiss Confocal LSM700 using a plan Apochromat 63x/1.4 Oil DIC M27 objective. Expression of lacZ in cells was visualized using excitation (488 nm) and emission (400-557 nm) wavelengths (from an argon ion laser) specific to detect fluorescein fluorescence, while cyanobacterial autofluorescence was visualized using excitation (561 nm) and emission (565-700 nm) wavelengths to detect cyanobacterial phycobiliprotein fluorescence. Typically we observe hundreds of filaments and then choose fields with sufficient representative filaments for imaging. Long, planar cyanobacterial filaments on a glass microscope slide under a cover slip are identified in the samples using bright-field microscopy with a plan Apochromat 63x/1.4 Oil DIC M27 objective. Bright- field images are obtained using the transmitted light channel during a 30 cycle, time-series acquisition. Images of phycobiliprotein autofluorescence of the same filaments are acquired by excitation using 561 nm irradiation from an argon ion laser and visualization at 565-700 nm using a 30 cycle, time-series acquisition. The gain is set at 600 and the focus is adjusted slightly to optimize phycobiliprotein autofluorescence emitted from the cells during a live, continuous fast scan. Typically, vegetative cells show higher levels of phycobiliprotein autofluorescence than heterocysts. Fluorescein, measuring lacZ expression, is excited using 488 nm irradiation from an argon laser and visualized at 400-557 nm using a 30 cycle, time-series acquisition. The gain to detect fluorescein is typically set at 800, but can be adjusted to detect lower levels of fluorescence. Cells emitting lower levels of fluorescence need a higher gain to visualize the fluorescence, whereas higher levels of fluorescence can be seen at lower gains. Images are saved and then converted to TIFF files for final analysis of the level and cell-type specific expression of lacZ (fluorescein) in the experimental versus the control strains. Examples of typical images are shown in Figure 1. Figure 1. 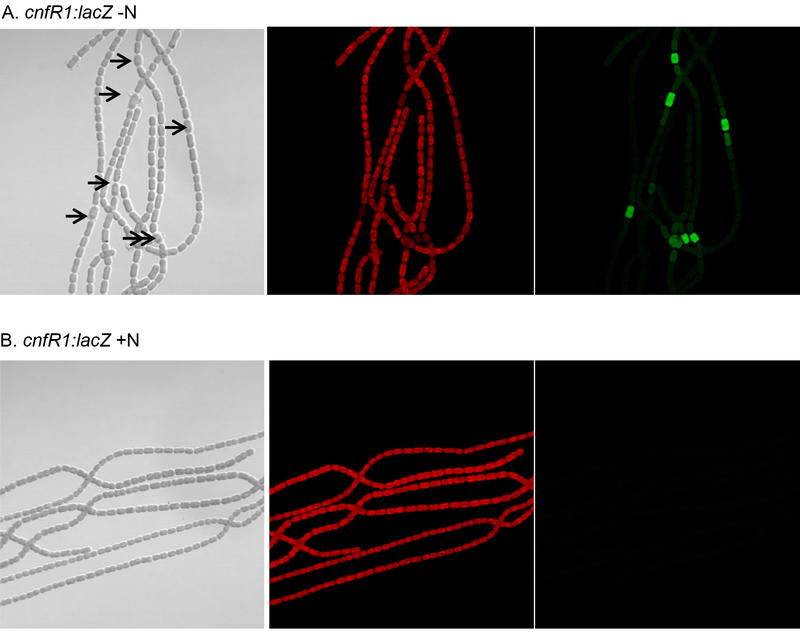 In situ localization of lacZ expression in an A. variabilis FD strain containing a cnfR1:lacZ reporter (BP830) (Pratte and Thiel, 2016) grown aerobically for 24 h after nitrogen depletion (-N) or with fixed nitrogen (+N). Arrows indicate representative heterocysts. Left panels: light micrographs; Middle panels: red fluorescence from photosynthetic pigments in cyanobacteria; Right panels: fluorescein fluorescence from cleavage of 5-dodecanoyl-fluorescein-β-D-galacto-pyranoside by β-galactosidase. Wash the cells treated with C12-FDG thoroughly to remove as much of the substrate as possible because it can lead to high background fluorescence. Protect cells from the light after they have been treated with C12-FDG, including when they are on the microscope slide. Use an anti-fade solution to prevent bleaching of the fluorescein by the excitation light. If C12-FDG does not work well in your cells, try unmodified FDG or other FDG derivatives: 5-pentafluorobenzoylamino-fluorescein, C8-FDG, or 5-chloromethylfluorescein (http://www.mobitec.de/probes/docs/sections/1002.pdf). If you prefer red fluorescence you can try resorufin or C8-resorufin labeled β-d-galactopyranosides (http://www.mobitec.de/probes/docs/sections/1002.pdf). Note: Anabaena variabilis is grown in an eight-fold dilution of Allen and Arnon medium (Allen and Arnon, 1955). This protocol was based on an earlier protocol for Bacillus subtilis (Bylund et al., 1994) that was modified for use in cyanobacteria. Support for this research was provided by National Science Foundation grant MCB-1052241. Allen, M. B. and Arnon, D. I. (1955). Studies on nitrogen-fixing blue-green algae. I. Growth and nitrogen fixation by Anabaena cylindrica Lemm. Plant Physiol 30(4): 366-372. Arlt, M. J., Born, W. and Fuchs, B. (2012). Improved visualization of lung metastases at single cell resolution in mice by combined in-situ perfusion of lung tissue and X-Gal staining of lacZ-tagged tumor cells. J Vis Exp (66): e4162. Bylund, J. E., Zhang, L., Haines, M. A., Higgins, M. L. and Piggot, P. J. (1994). Analysis by fluorescence microscopy of the development of compartment-specific gene expression during sporulation of Bacillus subtilis. J Bacteriol 176(10): 2898-2905. Chung, J. D., Conner, S. and Stephanopoulos, G. (1995). Flow cytometric study of differentiating cultures of Bacillus subtilis. Cytometry 20(4): 324-333. Currier, T. C. and Wolk, C. P. (1979). Characteristics of Anabaena variabilis influencing plaque formation by cyanophage N-1. J Bacteriol 139(1): 88-92. Griffith, K. L. and Wolf, R. E. (2002). Measuring β-galactosidase activity in bacteria: cell growth, permeabilization, and enzyme assays in 96-well arrays. Biochem Biophy Res Co 290: 397-402. Kumar, K., Mella-Herrera, R. A. and Golden, J. W. (2010). Cyanobacterial heterocysts. Cold Spring Harb Perspect Biol 2(4): a000315. Ma, P., Mori, T., Zhao, C., Thiel, T. and Johnson, C. H. (2016). Evolution of KaiC-dependent timekeepers: A proto-circadian timing mechanism confers adaptive fitness in the purple bacterium Rhodopseudomonas palustris. PLoS Genet 12(3): e1005922. Maldener, I. and Muro-Pastor, A. M. (2010). Cyanobacterial Heterocysts. eLS. John Wiley & Sons Ltd, Chichester. Miao, F., Todd, P. and Kompala, D. S. (1993). A single-cell assay of β-galactosidase in recombinant Escherichia coli using flow cytometry. Biotechnol Bioeng 42: 708-715. Plovins, A., Alvarez, A. M., Ibañez, M., Molina, M. and Nombela, C. (1994). Use of fluorescein-di-β-D-galactopyranoside (FDG) and C12-FDG as substrates for β-galactosidase detection by flow cytometry in animal, bacterial, and yeast cells. Appl Environ Microbiol 60: 4638-4641. Pratte, B. S. and Thiel, T. (2016). Homologous regulators, CnfR1 and CnfR2, activate expression of two distinct nitrogenase gene clusters in the filamentous cyanobacterium Anabaena variabilis ATCC 29413. Mol Microbiol 100(6): 1096-1109. Silhavy, T. J., Casadaban, M. J., Shuman, H. A. and Beckwith, J. R. (1976). Conversion of β-galactosidase to a membrane-bound state by gene fusion. Proc Natl Acad Sci U S A 73(10): 3423-3427. Thiel, T., Lyons, E. M., Erker, J. C. and Ernst, A. (1995). A second nitrogenase in vegetative cells of a heterocyst-forming cyanobacterium. Proc Natl Acad Sci U S A 92(20): 9358-9362. Zhang, Y. Z., Naleway, J. J., Larison, K. D., Huang, Z. J. and Haugland, R. P. (1991). Detecting lacZ gene expression in living cells with new lipophilic, fluorogenic β-galactosidase substrates. FASEB J 5(15): 3108-3113. How to cite: Pratte, B. S. and Thiel, T. (2017). Fluorescence in situ Localization of Gene Expression Using a lacZ Reporter in the Heterocyst-forming Cyanobacterium Anabaena variabilis. Bio-protocol 7(1): e2084. DOI: 10.21769/BioProtoc.2084.